Recap: The Amazing Race Philippines 2, Episode 1 (Leg 1, Day 1) – "I don't wanna die! I have a daughter, wait!" Derek Ramsay stands on a speedboat in Manila Bay introducing the 11 teams who will be Racing to 10 (!) destinations across the country. AJ & Jody, father & son baseball heroes from Zambales. As his coach, Jody feels AJ always focuses on him and goes easy on his teammates. Roch & Eji, pastry chef and her boss in the kitchen who promise to bake their competition alive! RR & Jeck, “besties” sharing the same interests and beliefs. Both have basketball significant others and they want to represent God on the Race. Phoebe & Matt, dating models who are both half-British/half-Filipino and come from different upbringings. JP & Kelvin, best friends who believe they exemplify “pogi,” not just with looks, but with attitude. Jet & Yna, brother and sister from a prominent family in Bulacan who want to prove they deserve to win the Race. Yna loves shopping. Derek welcomes the teams to the Starting Line at Baluarte de San Diego in Intramuros. The first team to reach the Finish Line after 10 Legs will win 2 house and lots from RCD Royale Homes, 2 brand new Kia Sportages and 2 million pesos. Derek also shows them the Express Pass which will be given to the winner of the first Leg. Derek tells them “Go!” and the teams are off to the first clues on their backpacks. And the first clue is a Road Block! 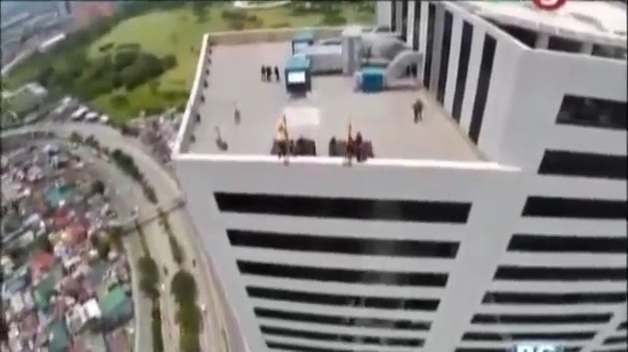 For this Road Block, teams must head to SM Aura Premier Tower and rappel 230 feet from the rooftop to receive their next clue. Teams scramble out of Intramuros to find taxis. Luz & Chen stop a cab and shoo away Vince & Ed who try to take it by putting their bags in the trunk. As other teams are able to catch taxis, RR & Jeck ask a jeepney driver how much to get them to SM Aura… at Mall of Asia. They quickly realize SM Aura is actually at Fort Bonifacio and they need a taxi. But they decide to hop into a jeepney until they can actually find one. Meanwhile, Tina & Avy’s taxi driver is old, so he drives less than 40 km/h the whole way. Jet talks about his fear of heights, while Zarah & Osang are craving for some of their chocolate. Chen & Luz and AJ & Jody are the first two teams to arrive at SM Aura. Luz and AJ get strapped on. Roch & Eji are 3rd to arrive, but they misunderstand the clue. 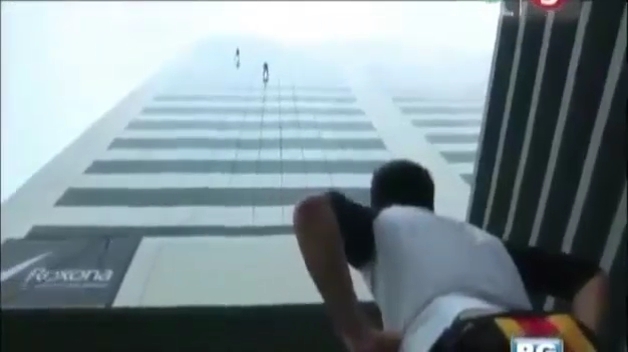 Roch drops Eji off on the 28th floor and heads back down to the ground floor. When Eji goes to suit up, he is turned back because he has no partner. That allows Zarah & Osang to slip into 3rd. RR & Jeck may have found a taxi last and argued the whole way to SM Aura because both logged on to “Nagmamarunong.com,” but they end up arriving 5th. While they could’ve gotten the #4 slot at the rappel, Jet & Yna take the number 4, followed by RR & Jeck, Daniel & Charlie and Matt & Phoebe. Vince & Ed and Kelvin & JP are 8th and 9th while Roch & Eji fall to 10th and Tina & Avy are last. Luz and AJ are now hooked up and ready to go. AJ lets adrenaline take over while Luz prays the Hail Mary. They both get down and reunite with their partners to open the next clue. Teams must now make their way to Imperial Ice Bar (which Jody knows of) and decode or decipher an ice puzzle to reveal their next destination. Zarah is next to rappel and excited to go. But seeing Jet scared stiff next to her, she decides to chat with him. In last, Tina pretends to be a unicorn and hurries down as she and Avy join the other teams on their way to Imperial Ice Bar. WOOHOO! The Amazing Race Philippines is finally back! It’s been a long wait, but definitely well worth it. It was a great, exciting premiere episode. Still not the biggest fan of the daily format, but it’s unavoidable I guess. Though it does appear that they’ve definitely tweaked the format to work a little better. There will only be 10 Legs this season (down from 13), but it seems we’ll get one full week, Monday through Saturday for each Leg. And judging from this first episode and the preview for tomorrow, they will have one task/Route Marker per ep. That’s definitely an interesting way to do it. It’ll take some getting used to, but right now, it seems we’ll be getting very long Legs! Those 6-episode 10 Legs will probably have enough tasks, challenges and Route Markers to fill two American TAR seasons. Baluarte de San Diego was a great Starting Line location. It would be a great Pit Stop or task location for an international TAR, I think. And the Road Block being the first clue, agad-agad/immediately was a nice surprise. 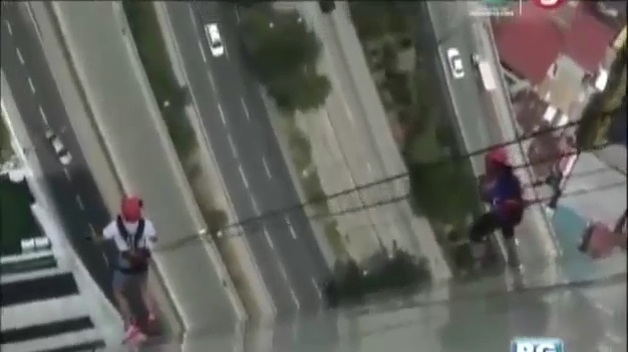 Having the adrenaline task be in the first episode is a smart decision. It definitely helped build the excitement. Now I’ll be doing team rankings at the end of each Leg. But I absolutely LOVE this cast already. RR & Jeck were the stars. From “SM Aura sa Mall of Asia” to “Nagmamarunong.com” to RR’s “Ay! Ay! Ay!! !” during the Road Block to their arguing? Other TARs can only dream of a team like RR & Jeck. Hehe. I’ve watched RR since she got her start on Wowowee, but I had no idea she could be this hilariously awesome. Luz was a standout this episode too. She had the most number of quotable quotes. Zarah was so cute nonchalantly chatting it up with Jet while rappelling face first down the side of a building. She was definitely awesome at the Road Block. I can see Zarah & Osang doing very well, especially with their travel experience. I wish we saw more of Vince & Ed trying to take Luz & Chen’s taxi though. You wouldn’t expect that from “nerds.” Roch & Eji look to be fierce competitors too. AJ & Jody are like the anti-Dave & Connor. And that is a very good thing. Tina & Avy were fun. I don’t think we’ve ever seen a “rich kid” team like Jet & Yna on TAR before, so they should be interesting to watch. Daniel & Charlie were good. Matt & Phoebe were under the radar, but I think we’re all waiting for that cupcake moment from the trailer, right? And JP & Kelvin were also under the radar. Overall, an exciting start to the Race. I was definitely more excited after watching this episode than after TAR25’s premiere, honestly. ← Recap: Power Rangers (Super) Megaforce, Episode (13) 33 – "So you failed, and you're proud of it?!"